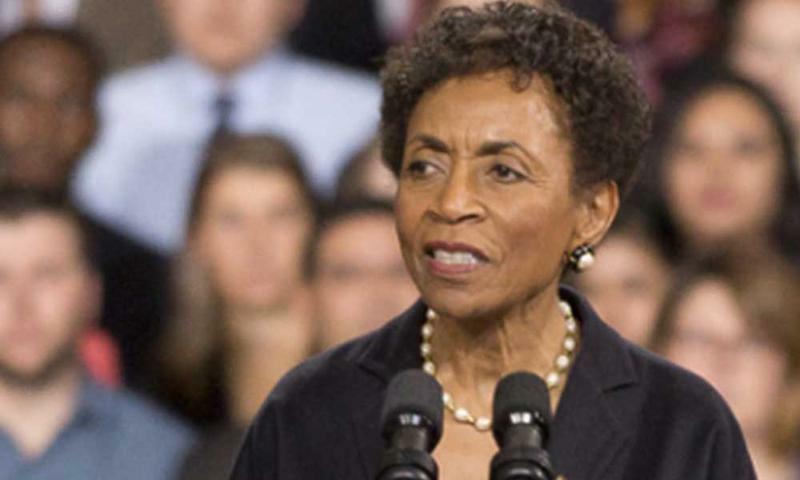 Bernadette Gray-Little is the former chancellor at the University of Kansas. 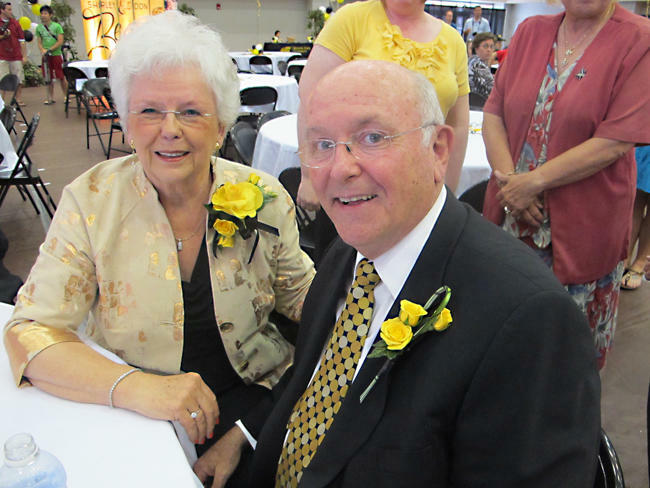 Don Beggs, shown with his wife, Shirley, retired as president of Wichita State University in 2012. The University of Kansas is being criticized for retaining former Chancellor Bernadette Gray-Little at a salary of more than half a million dollars. But the arrangement is far from unusual in Kansas. Former presidents and chancellors at other Kansas public universities were also hired as special advisers after stepping down. Details of their duties in those roles are sparse, but are often framed around helping the incoming president or chancellor transition into the role. Gray-Little’s retirement letter from the Kansas Board of Regents, which officially offered her the adviser role, mentioned an expectation that she would continue to raise money for the university. “During your tenure as Chancellor, you have developed an impressive array of strong donor relationships,” the letter reads. “We are confident that we will benefit from your willingness to provide assistance in this area." Former state university leaders — including Gray-Little — were given salaries similar to what they received while in charge of their respective universities. The biggest difference with Gray-Little’s arrangement is the amount. Gray-Little’s salary was $530,000 for her role as special adviser in 2017 — and during her role as chancellor. Don Beggs of Wichita State University received about $280,000 in 2012 as a consultant after retiring and Ed Hammond of Fort Hays State received about $265,000 in 2014. Hammond’s retirement letter also approved him going on sabbatical in 2015, the same year he was to start as a professor. That year he received about $276,000 — about $10,000 more than he received as an assistant to the president in his advisory role. Last year he made $140,000 as a professor at Fort Hays State. Gray-Little’s role and salary have been contentious issues at KU, which has been accused of wasteful spending before, such as the use of private planes. The university was also recently accused of violating Kansas open-record laws when it decided on Gray-Little's salary and offered her the role. “It’s got a lot of faculty members, staff and students hopping mad,” said Ron Barrett Gonzalez, a professor of aerospace engineering at KU. Gonzalez argues that it doesn’t matter that other leaders received similar deals. He says that money could instead be used to cut tuition and raise the salary for faculty. “And instead it gets spent on senior administrators?” Gonzalez said. “Not good." Professor salaries have remained mostly flat over the last decade, causing further irritation over Gray-Little’s salary. As chancellor, her salary rose at a much faster rate than the average instructional faculty at the university. "The gap between the lowest-paid worker and the highest paid executive is increasing and increasing,” said Joe Harrington, an English professor at KU. Harrington said that while the gap is growing in the private sector as well, state universities’ reliance on donations, tuition and state funding means they should act differently. And the battle over the state funding is the backdrop for the discussion over Gray-Little’s salary. While K-12 funding has received more attention due to the back-and-forth between the Kansas Legislature and state Supreme Court, higher education funding was also part of the recent budget debate. While higher education advocates argued for more state funding, lawmakers pointed to Gray-Little’s salary as proof that the financial situation at state universities couldn’t be as bad as advocates claimed. Lawmakers did end up restoring $15 million in funding for higher education, though that was short of fully restoring a $30 million cut in 2016. Harrington said that in addition to the bad optics that higher administrator salaries project, universities simply can’t afford these types of salaries. The Kansas Board of Regents did not respond to a request for comment. Stephan Bisaha reports on education for KMUW in Wichita and the Kansas News Service, a collaboration of KMUW, Kansas Public Radio, KCUR and High Plains Public Radio covering health, education and politics. Follow him on Twitter @SteveBisaha. Kansas News Service stories and photos may be republished at no cost with proper attribution and a link back to the original post. 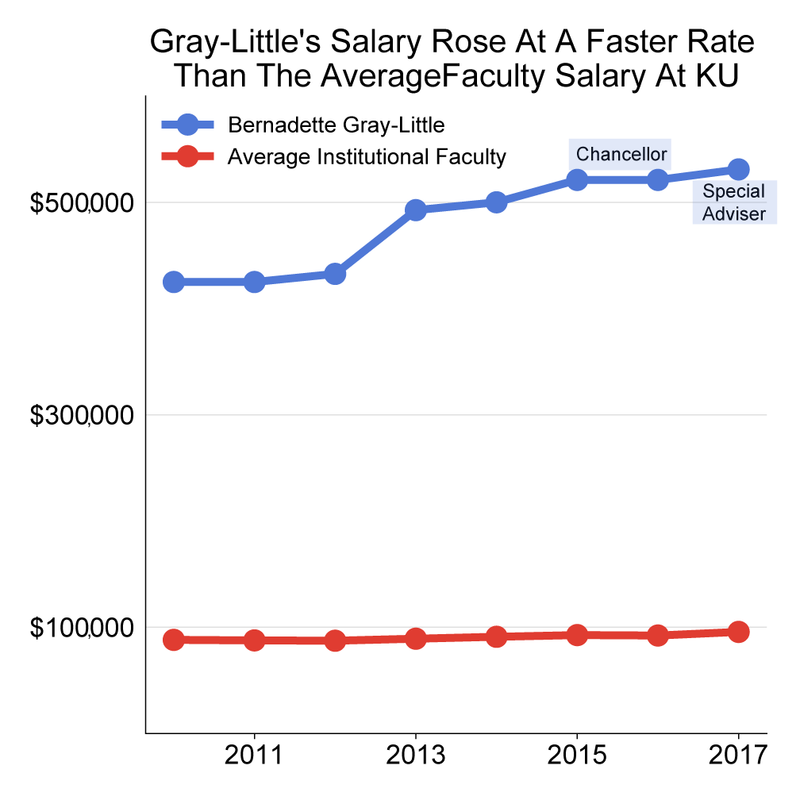 Since it was revealed that former University of Kansas Chancellor Bernadette Gray-Little was still on the payroll as a consultant, there have been questions about exactly what she is doing for her $510,000 salary.